A significant jump in overall voter turnout was seen in 2015, at 68.3% compared to 61.1 in 2008. Several factors accounted for the increase, including general voter interest, but the most important change was the greater participation of younger voters. Elections Canada calculates that 57.1% of eligible Canadians aged between 18 & 24 voted in 2015, compared to just 38.8% in 2011. As well, the voter turnout for those aged between 25 & 34 grew by 12.3% between the two elections. The 2011 election saw a rise in voter turnout compared to the 2008 elections, at 61.1. This rate may rise modestly as the initial figures do not include some special ballot votes. The 2011 turnout marked an improvement over the participation rate seen in 2008 (58.8%). 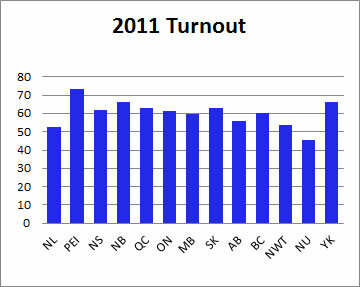 The voter turnout in 2008 dropped to the lowest percentage of registered voters ever recorded for a national election in Canada. A number of explanations can be offered for the drop of over 5% from the 2006 election. First, there was little to galvanize the electorate in terms of policy issues. Although the crisis on global financial markets erupted during the last two weeks of the campaign, there was little to differentiate the policy responses of the political parties. Secondly, the Thanksgiving long weekend immediately preceded election day on Tuesday Oct 14. Momentum could have been lost for many voters with only a mild attachment to the process. Thirdly, this was the first election with new voter identification rules, and an unknown number of electors were turned away at the polls for not presenting correct ID. Finally, there was a widespread disenchantment among Liberal voters, who turned their back on an uninspiring leader and the contentious Green Shift carbon tax plan. A review of the differences in votes cast for the 5 major parties in 2006 & 2008 reveals the enormous drop in turnout for Liberal voters, and to a lesser extent Bloc Quebecois and Conservative voters as well. A good many Liberal voters undoubtedly moved to support the Green Party, but the growth in Green support came from all parties, as well as many of the 350,000 new voters added to the list since the 2006 election. Overall, there is little doubt that somewhere between 600,000 and 700,000 Liberal supporters did not vote. That number of voters alone accounts for up to a 3 point drop in voter turnout. 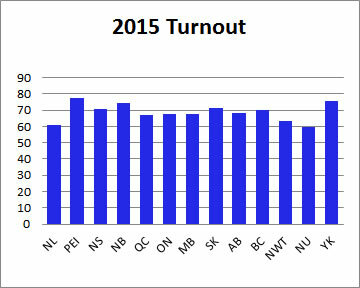 Much has been made of the general decline of voter turnout in recent Canadian elections. The historical record presents a useful perspective on this trend. It is certainly true that the percentage of registered voters who cast ballots has declined- - especially since 1993. However, it is important to note the number of fluctuations over the years of the numbers and percentage of registered voters as a percentage of the whole Canadian population (as measured at the census prior to the election). When one computes the percentage of votes cast as a percentage of the whole population, then the decline is not nearly so dramatic. Indeed, the 45% level registered in the 2000 and 2006 elections is well within the range of 40-50% of Canada's total population seen since 1935. Even the most recent election in 2008 remains within that historical range. The reality of citizen participation is, however, more complex that those raw numbers suggest. The changes in age cohort shares of the population have had an effect over the years. For example, the portion of Canadians under 15 years of age has dropped from 32.5% in 1941 to 17.6% in 2006; this figure is calculated from Census data available at Stats Canada. With this change in demographics in mind, one actually should have seen an increase in the percentage of Canada's total population who vote in an election as the Canadian population aged. 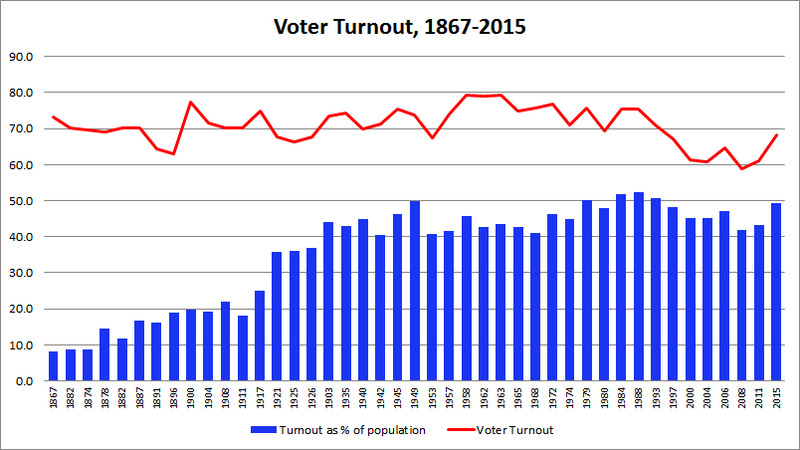 Unfortunately, there are some fundamental problems when one tries to compare voter turnout over long periods of time. Because "turnout" is simply the percentage of the people on a list of eligible voters who actually vote, the reliability of that measure depends entirely on the accuracy of the list of eligible voters. In most of the second half of the 20th century federal election lists were compiled by door-to-door visits. Many people were not included on the lists who would otherwise have been entitled to vote. People who had no interest in voting could simply refuse to answer questions when the enumeration officials visited a neighbourhood. As a result there has never been a completely accurate registration of all eligible voters. Various methods of compiling voter lists may have left from 5 to 15% of possible voters off the official lists. For example, Quebec's list of electors grew by over 13% in the two door-to-door enumerations undertaken for the 1994 and 1998 elections (see: Monique Michaud, Permanent List of Electors: The Quebec Experience). Thus, the official turnout figures for those two provincial elections cannot be directly compared. The establishment of a permanent National Register of Voters for federal elections has not been entirely reliable either. For example, the official voter turnout figure in 2000 is 61.2%, but Elections Canada later realized that this was based on a voters' list that was artificially inflated by almost a million duplicate names. The actual turnout figure is now estimated to be about 64.1%. See the CBC News article about this updated information. Also, it is difficult to ascertain reliably how many non-voters are included in the electoral list, simply by checking the right box on their income tax form or by getting a driver's license, who are not legally qualified to vote. Given the vagaries of door-to-door-enumeration and other errors that are almost inevitable in a permanent register of voters, one should not place too much emphasis on precise differences in turnout for particular elections. Nevertheless, there does indeed appear to have been a drop, over the last 15 years or so, in the number of eligible voters who actually end up casting ballots. Various studies have delved into what may lie behind a drop in voter participation. But even academic surveys of non-voters have their own fundamental problems as the less engaged in the political process individuals are, the less likely they are to participate in surveys about why they did not vote. But we can tell from an historical review of voters lists that far fewer people under the age of 25 are voting than did 3 or 4 decades ago. Some researchers have argued, as a result, that youth should be targeted by various civic campaigns to engage them more fully in elections. Others have argued that non-voting is not simply a function of the youngest cohort of voters. Henry Milner, for example, believes that survey evidence points to a lack of political knowledge as the fundamental factor behind non-voting across all age groups. As far as our youth are concerned, schools may be failing to prepare them properly for citizenship. Other comparative research has suggested that countries with much more door-to-door canvassing have higher rates of voter turnout. Canadian campaigns have come to rely less and less on repeated doorstep contact in favour of central advertising campaigns and mass mailings, and this approach may result in a less directly personal involvement among voters. Other more practical issues may have a role as well. In old-style elections up until the late twentieth century, election day 'treating' was common place in many areas of the country. Folding money, a mickey of rum, or a box of chocolates were widely dished out to voters on election day. In short, modern elections may just not be as much fun! Compulsory voting is sometimes proposed as a solution to falling turnout. A number of other countries, such as Australia & Brazil, have cumplosry voting. An Ekos poll conducted in September 2009 found that 49% of Canadians would support this change while 36% are opposed. André Blais, Agnieszka Dobrzynska, and Louis Massicotte, "Why is Turnout Higher in Some Countries than in Others?" Jon H. Pammett and Lawrence LeDuc, " Explaining the Turnout Decline in Canadian Federal Elections: A New Survey of Non-voters"
Source: Elections Canada, Voter Turnout. 1867-2011; voter turnout 2015, Elections Canada, population estimate for Jan 1, 2011, Statistics Canada and for Oct 1, 2015, Statistics Canada. * While the oficial turnout figure in 1993 is 69.6%, Elections Canada later realized that their official list of registered voters was skewed by an outdated voters list in Quebec. They calculated that the actual turnout was 70.9%. See note 4 at the end of this page from Elections Canada. Be aware that the number listed in the registered voters column for 1993 is the inaccurate "official" number. ** The official voter turnout figure in 2000 is 61.2%, but Elections Canada later realized that this was based on a voters' list that was artificially inflated by almost a million duplicate names. The actual turnout figure is now estimated to be about 64.1%. See the CBC News article about this updated information and also note 5 at the end of this page from Elections Canada.